whole | Have YOU Ben Starr Struck? It was like pulling teeth to summon the courage to watch this week’s episodes. Honestly, I’m both bored and horrified by what MasterChef has now become, and I REALLY want to stop watching it. But I’m getting so much feedback from all of you that you’re enjoying my recaps…I’m gonna do it for at least another week. And I’m hoping maybe the producers will grace the audience with at least some redeeming quality in these next 2 episodes to give us decent human beings SOMETHING to latch onto. I’m a little surprised they pulled the pig’s head card. On my season when we had the pork challenge, the “scary” cuts were left out because the producers thought the mainstream American audience wouldn’t be ready to see the head or the ears or the heart or the bung. They tested the waters last season with a mystery box of organ meats, including testicles, and apparently the audience didn’t stop watching. So they pulled out the heads this year. 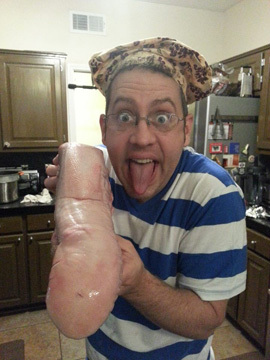 I’m really excited, because I love cooking a pig’s head. I think many people are uncomfortable with the head because it reminds them that what they are eating was once alive. If that’s the case, it’s critical that you either reconcile yourself with your carnivorous habits immediately, or stop eating meat forthwith. All meat was once alive. (For that matter, virtually ALL we eat was once alive, including vegetables and milk and fungi and yeast. In fact, it might be hard to think of a single thing we eat that was not once living other than salt.) A good place for you to start in this inner struggle is with my blog posts from a year ago about the ethics of eating meat and the follow up blog, as my fan base was really electrified by this debate following a photo I posted of a rooster I was about to “harvest” for a meal at FRANK for Bastille Day. So even if your natural response to an organ meat or a bizarre cut is initially revulsion, let logic reign in those moments and realize that you’re just looking at another cut of meat that can be truly stunning in the hands of a capable chef. But all that knowledge chefs harbor for working with these “variety meats” or offal doesn’t magically be bestowed upon them from the heavens…the body of knowledge regarding working with organ meats and unusual cuts comes to us STRAIGHT from the kitchens of farmers and “peasants” throughout history. When Joe says, “There’s no longer home cooking here, this is professional cooking,” he’s right if he’s referring to Middle America, but dead wrong from a global perspective. These meats are cooked and served FAR more frequently in humble home kitchens around the world than they are in restaurants. The judges are soft on the contestants because they have already broken down the pig’s head into the ears, tongue, cheek, and snout…so the contestants don’t have to do any butchering. (Though some, including Eddie, are brave enough to tackle the whole head anyway!) All 4 of these cuts are prized in famous food cultures around the world, particularly in Italy and France. Gordon says he’d blanch the tongue, then braise it and serve it with cream and mashed potato and horseradish. (YUM!) I wish we’d have gotten more education from the judges at this point, because it would be VERY valuable for the audience to hear what Graham and Gordon would do with EACH of the 4 cuts. I’d have a hard time with this challenge simply because, while the 90 minute time limit is a bit longer than usual, these cuts really come into their own through TIME. The jowls can be wet-cured over a period of several hours in a potent salt and brown sugar brine, then smoked to become jowl bacon, which can then be turned into something miraculous. (Jowl bacon is like regular bacon, but much heartier with more lean than even center-cut bacon. Michael Chen is sitting next to me as I write, and waxes eloquently about how the “lean” in bacon is entirely separate from the fat, but the muscle fibers in jowl are marbled throughout with bits of fat, making the “lean” in jowl much more succulent than in bacon.) The tongue can be brined for a week, turning it into pastrami, and then cooked en sous vide (vacuum sealed and slowly cooked at low temperature in a water bath) for 2 days until it’s meltingly tender…and the sandwich you can make with that will change your life. Or it can be made into tacos de lengua…my very, very favorite type of taco. Or it can be halfway frozen, sliced thinly, marinated in ginger and soy and garlic, and seared briefly…the way the Koreans enjoy it. The ears can be pickled over a week, then braised and then crispy fried and turned into a brunch sandwich suitable for the gods. The snout is the most complex of the cuts…filled with both fat (flavor and richness), connective tissue (which melts into a stock with incredible body and mouth feel), and muscles that get almost constant use, so they are exploding with meaty flavor and texture. The cut is so complex that you can simply add it to water with some seasoning, and a root vegetable like parsnip or rutabaga, and some legumes (beans or lentils) and an exquisite soup will result…especially in the pressure cooker. Beth is headed down the Southern route with cornbread, black eyed peas, collard greens, pork jowl and crispy pig’s ears. Southern cuisine has the same reverence for pig meat as the Italians…it’s almost sacred. 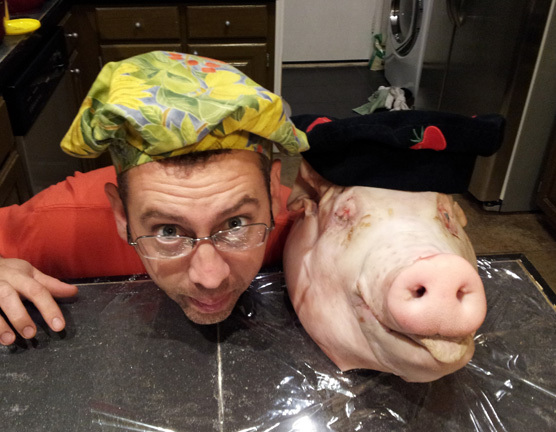 Poor Bri…she’s had to cover the pig’s head with a towel while she cooks because she can’t look at it. I would imagine Bri is a vegetarian because she chooses not to take the life of an animal to sustain herself, so this challenge must be really difficult for her. We rarely see a vegetarian go so far in the competition on MasterChef, and Bri is one of my favorites…I wish they’d show more of her because she seems to me to be a peacemaker and to be really funny, and we need more of both. Despite her aversion to eating meat, the dish she’s preparing sounds divine…crispy pig’s ear with poached egg and heirloom tomato salad, and she’s going to be doing something with the cheeks, as well, but they edit that out. Jonny has braised the tongue and cheeks in pork stock, red wine, and mirepoix (pronounced “meer-PWAH”…a classic French foundation for sauces and braises: a simple combination of onion, celery, and carrot). I see him warming tortillas, so he’s making tacos! Jessie is cooking with the cheeks and she’s making a black bean, jalapeno, and roasted corn salsa…and doing a fusion of Mexican and Southern cuisine. This is a mystery box where I think the audience deserves to see EVERY dish tasted, because we’re being introduced to ingredients that make many of us uncomfortable. So drooling over some incredible dishes is one of the best ways to get us over that discomfort. But, like always, only 3 will be tasted. Lynn is chosen first. He’s got red wine braised pork cheeks that were subsequently fried to a crisp, served on top of pork tongue braised with Asian spices, with parsnip puree and ginger scallion oil, and fried tomatoes. Lynn’s plates always look stunning. The judges are supremely impressed. The next twist is that the contestants have to cook blindfolded. I don’t expect this to last more than about 60 seconds, otherwise everything’s gonna be broken and people are gonna lose limbs and eyes. (Let’s not forget that Christine had an assistant during her challenges to help her locate ingredients and stay on track.) And, of course, the blindfolds come off almost immediately. Bri is making a light crab salad with mashed peas, corn puree, and champagne vinaigrette. And let’s not forget that she has to kill the crab…her first time having to do this on the show. Luca is making a crab risotto, and he adds some fish sauce to the risotto stock “to make Christine happy.” Having not yet seen the results, I’m puzzled about a comment Luca made on his Facebook asking people not to comment on his fish sauce risotto and just leave him with his grief. There’s NOTHING wrong with a drizzle of fish sauce in almost ANY dish. The Italians used fish sauce before it was ever introduced to the west from Asian cuisine. I use fish sauce in almost EVERY Italian dish I make. James is doing a Creole dish and finds it’s weird that Krissi is pairing her catfish with mashed potatoes. “We don’t do that where I’m from,” he says. James?!? You live in Texas. Fried catfish is ALWAYS served with mashed potatoes and gravy here. That’s totally normal. But Joe decides to be incredibly angry with her for making a traditional Southern catfish dinner…he wants something more sophisticated and doesn’t even want to taste it. (Might I remind him that on my season, Whitney Miller…the winner of season 1…returned to present a challenge where we cooked catfish, fries, and coleslaw, and he didn’t complain then.) This whole thing is ridiculous…nothing more than the producers trying to spin us back on Krissi from the last episode where she “targeted and eliminated Bime”…it’s not real. Don’t believe it. Beth is doing crab cakes with peach salsa. Natasha is also doing crab cakes with Asian flavors. Gordon asks her if she’s using the dark meat as well as the white meat…some species of crab have varying grades of meat within them. The muscles that drive the crab’s swimming legs are larger, pale and more delicate in flavor, than the pink meat from the claws, or the darker meat found inside the body, which are stronger in flavor. Time is called and judging begins. Krissi is first with her bacon cheddar mashed potatoes, asparagus, and cornmeal crusted fried catfish. She left the skin on, which Gordon chastises her for. This is a ridiculous criticism. Catfish skin is often left on when frying the fillets. It’s the “peasant” way of cooking, which, were we talking Italian food, would be praised by Joe. But Gordon says Krissi is cooking for the JUDGES and to set aside her own preferences. (They told me something similar on my season when I didn’t peel the asparagus I served. My reply to the judges, which did NOT get edited into the show, was that most of the flavor, texture, and nutrients in asparagus are located in the skin, and that if the skin of the asparagus is too tough to eat, I just won’t cook with asparagus. Peeling asparagus is ridiculous. Either you eat asparagus whole, or you don’t eat it.) I was told, “You’re not cooking for yourself, Ben Starr, you’re cooking for Master Chefs.” That was drama. Just like this is. 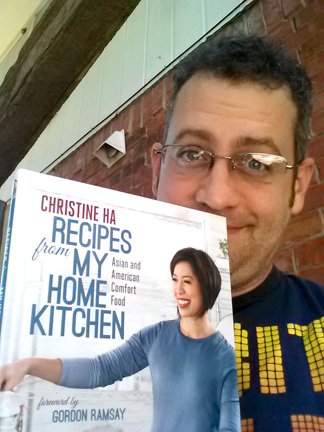 (It should be noted that in Christine’s catfish stew recipe in her book, she says that she prefers to have the skin off because she finds it a bit oily. I typically only see the skin left on when catfish is fried…exactly how Krissi prepared it.) I love how Krissi realizes that all this is false drama, and she sort of smiles at it all. “Because I had to fight with Joe, they’re going to bash me no matter what,” she says. Joe acts like a third-grader and continues to call her out even after she’s back at her station. What a waste of air time when there are delicious dishes we could be shown. The editing of this whole sequence is so ridiculous, I’m embarrassed for the show. They’re trying to butcher Krissi for the way they edited her on the last show, in some sort of gladiator fashion, as if the audience is thirsty for her blood. But she didn’t ACTUALLY produce a bad dish in this challenge, which is clear from looking at it. So all this criticism and drama is completely fabricated, and it shows. Disgusting. Natasha’s Asian-influenced crab cakes with beets, pickled radish, and champagne vinaigrette look nice, and the judges and Christine enjoy it. Bri brings up her summer crab stack with pea and avocado mash. Graham is impressed with her classic combinations (peas and crab, shellfish and corn). James brings up his spicy crab creole with rice and seafood broth. Christine loves the levels of flavor and the heat. Beth has Dungeness crab and “marscapown” crab cakes. (We’ve already addressed this, but there is ONLY one correct pronunciation of the Italian soft cheese called mascarpone, and it is this: “mas-car-POWN-eh.” There is only one “r” and it does NOT come before the “s.”) She has Meyer lemon and herb creme fraiche and grilled peach and avocado salsa. Sounds delicious, despite the mispronunciation, Beth! Joe spits it out and says it tastes like raw, mealy flour. Luca presents a bowl of soup, and the judges are puzzled when he tells them it’s actually a risotto with crab, asparagus, and lemon. Christine says that initially it’s too salty. Joe makes him bring up the bottle of fish sauce and says that “to put fish sauce in a risotto, all of Italy will weep.” Again…complete lies. Fish sauce is as integral in Italian classic cooking as red wine. In Italy it’s called “colatura” and here’s a link to a variety of different types you can purchase on Amazon. And here’s a link to a Google search for “colatura risotto” that will lead you to a lot of pages in Italian with risotto recipes that utilize fish sauce. It irks me to NO END when any of the judges make these sweeping statements about food being governed by black-and-white cardinal rules…ESPECIALLY when their statement is completely and utterly false. It is PERFECTLY ACCEPTABLE to put fish sauce in risotto, Joe, and if you don’t know that, you might need to go back to Italy for another summer of food education. The top 2 are Natasha and James, who was declared the best. The 3 worst are Krissi, Luca, and Beth. And the axe falls to Beth. I loved Beth from the first moment I saw her. She has such a kind face and a tender heart. If the producers would have featured more of her, the show would have been easier to watch, because she’s GOOD PEOPLE. Read her bio on her amazing website, Local Milk, and you’ll find out that she studied philosophy and creative writing at Loyola and spent many summers in the Netherlands, before gravitating toward both the camera and the spatula. Beth is the kind of person I want to meet and cook with. I hope, someday, that will happen. Follow Beth on Facebook and Twitter, and please leave your comments below!